I love to photograph silhouettes, and I also like to create them in Photoshop. 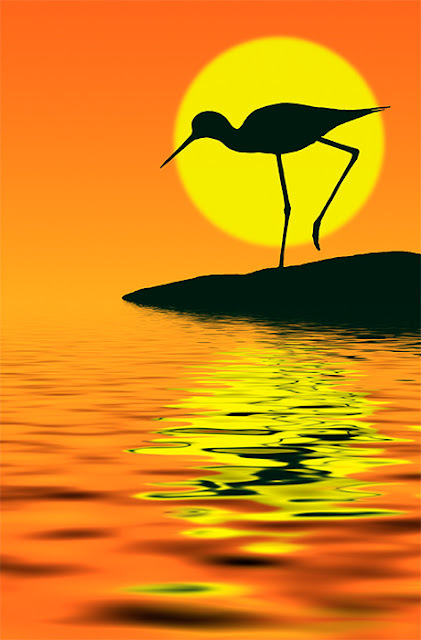 Here is a silhouette that I put together for a tutorial for Photoshop Creative magazine a few years ago. You can create this look easily in Photoshop by using a few tools in Photoshop, and also by using a really fun filter called the Flood Filter from Flaming Pear. This filter lets you create s a watery reflection is customizable for a unique and beautiful look with your photos. You can adjust the horizon, the waviness of the water, and the look of how the ripples will be rendered in the composition. It's a great filter, that is relatively inexpensive and easy to use. I teach a few creative techniques on using the Flood Filter, and more in my Photoshop - Enhancing Images course at BetterPhoto.com! I'll be traveling this June, but classes will start again in July, I hope to see you there!